The seven social sins are politics without principle, wealth without work, commerce without morality, pleasure without conscience, education without character, science without humanity and worship without sacrifice." On June 15, 2008 a memorial sculpture was unveiled in honour of John Peters Humphrey, the author of the first draft of the Universal Declaration of Human Rights. Historica’s acclaimed one-minute movies about Canadian history. This website features a profile of John Peters Humphrey and an overview of the Centre’s human rights initiatives. 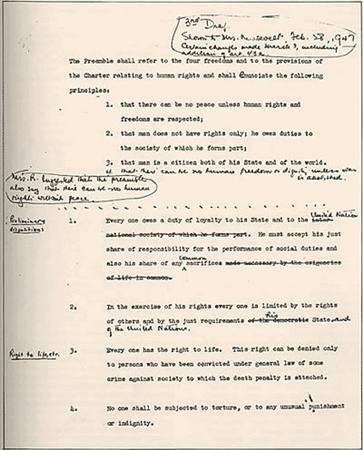 A CBC Radio feature about John Humphrey and the Universal Declaration of Human Rights. View a lively animated version of the rights set forth in the “Universal Declaration of Human Rights.” Just one of the many interactive features devoted to the exploration of human rights available at the website for the Canadian Museum for Human Rights. See also the multimedia profile of distinguished Canadian diplomat John Peters Humphrey, who was instrumental in the creation of this landmark document. The John Humphrey Freedom Award, presented every year to an organization or person who has made an outstanding contribution to the promotion of human rights and democratic development. From the Rights & Democracy website. A virtual online exhibit devoted to the life and career of John Peters Humphrey, the first Director of the Human Rights Division in the United Nations Secretariat. From the website for the McGill University Archives. A quarterly Canadian magazine devoted to peacemaking, disarmament, conflict resolution, global stability, and related concerns. Offers online articles and letters from current and previous editions (from January 1983 to present). Also, the first Canadian magazine to be produced with desktop publishing software. From the Canadian Disarmament Information Service.